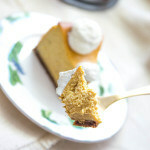 This Gluten-Free Pumpkin Cheesecake is so creamy and delicious, no one will have any idea it’s gluten-free! The real knockout here is the pumpkin cheesecake filling: it’s rich and creamy, thanks to vanilla extract and gluten-free flour (or tapioca flour) with a TON of pumpkin flavor. Every time I serve this cheesecake, I get requests for the recipe – and my family starts asking for it as soon as October 1st hits. No one will be able to tell it’s gluten-free pumpkin cheesecake, so this is recipe is perfect for parties and get-togethers where you want to share a killer dessert that everyone can enjoy. I think the gingersnap crust is a special surprise. It pairs incredibly well with the smooth filling, but you could use graham crackers if you prefer. The ginger really complements the spices in the cheesecake without being overpowering, and makes this recipe memorable. You can use any gluten-free graham crackers or crispy gluten-free gingersnap cookies you choose, but I really like the ones from Pamela’s. 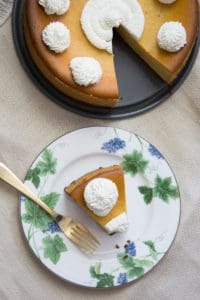 I like to serve this gluten-free pumpkin cheesecake with a dollop of vanilla bean whipped cream (vanilla bean paste is the secret) hot coffee, and good friends. Add the cookies or crackers to the bowl of a food processor, and pulse until crumbly. While pulsing, slowly add the melted butter, stopping occasionally to scape down the sides. Once thoroughly mixed, press the mixture into a 9-inch springform pan with 3-inch sides. Bake the crust until golden brown, about 10 minutes. Remove from the oven and let cool completely while preparing the filling. Put a teakettle filled with water on the stovetop, over medium heat, and bring to a boil. In a large mixing bowl, add the cream cheese and sugar and beat with an electric mixer until light and fluffy, about 2 to 3 minutes. Add the pumpkin and beat until incorporated. Beat in the eggs, 1 at a time, then add the cinnamon, ginger, nutmeg, cloves, salt, and vanilla, and beat until blended. Add the gluten free flour or starch and beat until incorporated. Wrap the sides and bottom of the springform pan with heavy-duty aluminum foil. Pour the filling into the pan and put it in a small roasting pan. Pour the hot water from the teakettle into the roasting pan, filling halfway up the sides of the springform pan, about 1 1/2 inches. Bake until the center of the cheesecake moves slightly when the pan is gently shaken, about 1 hour and 20 minutes. Remove the cake from the water bath and let it cool on a wire rack. Once cooled, use a paring knife to loosen the sides of the cake from the pan. Chill the cheesecake for at least 4 hours before serving. This entry was posted in Baked Goods, Desserts, Pumpkin Everything!, Recipes and tagged dessert, G-Free Foodie, gluten free, holiday, kc cornwell. Bookmark the permalink.